Assistant Professor of English Marie Drews (‘02) gave a Paideia lecture about the ties between culture, food, and identity. 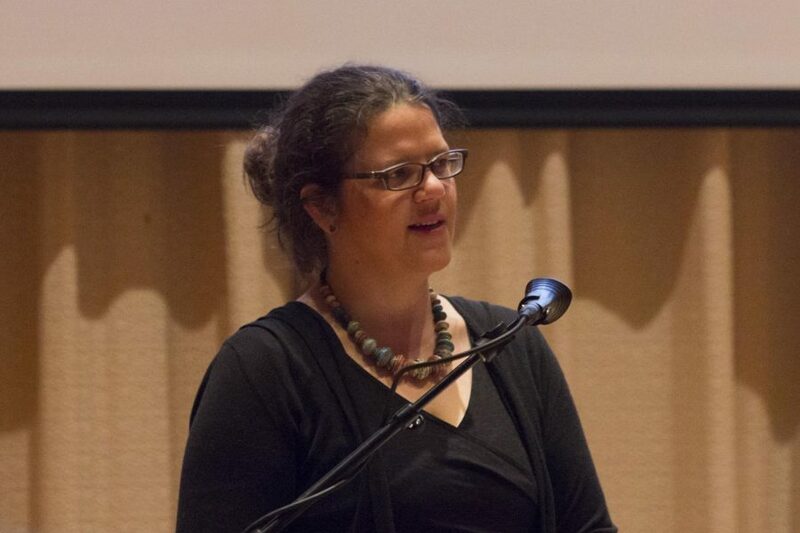 Assistant Professor of English Marie Drews (‘02) presented a Paideia Text and Issues Lecture titled “The World on a Plate: Ambivalent Encounters at the American Table,” on April 2 at 7 p.m. in the Center for Faith and Life Recital Hall. This seminar acted as the fourth and final Paideia Texts and Issues lecture of the 2018-19 series “Journeys and Hospitalities.” There was a discussion in the Qualley Lounge following the lecture. Drews’s lecture explored the works and convoluted identity of Winnifred Eaton, a woman of Chinese-British ancestry who published a vast number of works under an assumed Japanese name, Onoto Watanna, during the early 20th century. Drews primarily focused on “The Chinese-Japanese Cookbook,” co-written by Eaton and her Chinese identifying sister, Sara Bosse. Winnifred Eaton lived and published as a Japanese-American during the early part of the 20th century, and was one of the first individuals in the Western world to successfully write about Asian cuisine. She attained this by enforcing common misconceptions of the time of Chinese and Japanese food cultures within her text, in order to appeal to her readership of predominantly white middle-class women. She first acknowledged the American’s “natural repugnance” towards “oriental” foods, misattributed several dishes as being Mandarin in origin, when they were in fact Cantonese, and included five different recipes for Chop Suey, a dish widely-believed to be an American invention. Assistant Professor of English Marie Drews (‘02) lectures on the American table, finishing the “Journeys and Hospitalities” series for the year. Associate Professor in Library and Information Studies Rebecca Sullivan (‘84) is a member of the Paideia Governing Board selection process. 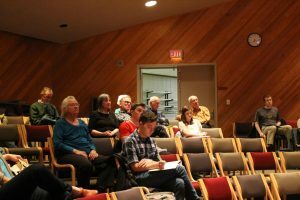 “The Paideia Governing Board sets an annual theme for the lecture series, puts out a call for lecture proposals, and then reviews those proposals to present a diverse but cohesive series of lectures,” Sullivan said. According to Sullivan, Drews’s interest in and proposed topic of the pervasive theme of national identity and interhuman connection found in cookbooks and domestic manuals intrigued the committee, and she was selected to deliver the final lecture of the series. Drews used the lecture to describe how Eaton created an “Amerasian” space for her readers through her different texts. “Amerasian” is a term used to describe a person with one Asian and one American parent. In Eaton’s novel “Miss Nume of Japan,” a Japanese character eats an American-style meal for the first time, and describes it as ‘the barbarian food,’ which was a way of reversing the expected dialogue. Her story “The Wife of Shimadzu” is an account that highlights the importance of authenticity and multi-ethnic exchange, rather than the selling out of one’s culture for financial gain. “A Japanese Blossom” tells the tale of a white widow who marries a Japanese man. She and her white son stop at a Japanese tea house, where he asks for Chop Suey. Drews interprets this interaction as an alignment of American, Chinese, and Japanese interests. To find an Americanized Chinese dish in a Japanese eatery reflects Eaton’s more nuanced and complex treatment of Pan-Asian identities. Eaton would eventually acknowledge her own hybrid identity when writing an article to protest the San Francisco movement to exclude Japanese immigrants from public school systems. In her article, she remarks that she was more Irish than English, and Chinese as well as Japanese, but longs for a day when all people could simply identify as world citizens. This passage represents the only time Eaton publicly recognizes her Chinese heritage. Levi Bird (‘21) enjoyed how Drews incorporated deep meaning in a unique topic. “I felt that it was eye-opening in the sense of addressing culinary aspects of culture within history and within our own identity and how we bring that to the community that we are a part of” Bird said. In her concluding statement, Drews fully admitted that she did not have all the answers to several questions that Eaton’s narrative inspires: What are the ethical implications of her culinary worldliness? What does her story say about the fluidity of identity and truth? What were motives behind creating a blended space for her readership? These are ideas that Drews wants her audience to grapple with, and continue to return to as they grow in experience and understanding.